The weather alone should make for a pleasant night at Lee Harvey's this weekend, and as an added bonus, LH hosts The Theater Fire with Austin's Mermaid Blonde on Saturday. Paul Brinkley shoulders the load in Mermaid Blonde while also contributing to a band called Goodnight, Fish. GF has demonstrated organizational wherewithal and a willingness to saunter up I35 to play the occasional DFWd show, but Saturday night will be MB's first attempt in Dallas. What's the relationship between Mermaid Blonde and Goodnight, Fish? Are you the only member that's in both bands? I am Mermaid Blonde, at least from the recording sense, and in a “normal” lineup live, I would be the only common factor, besides Art (Narrow Escapes, Meryll) who has been playing with Goodnight, Fish lately. However, due to extenuating circumstances, Brendan (a major component of Goodnight, Fish) will have a key role to play at this particular show. Mermaid Blonde was conceived of as an Austin only band in order to facilitate shows, but seeing as how this show is in Dallas, and my longtime musical co-conspirator lives in Fort Worth, I was happy to make an exception, and luckily, Brendan agreed to help out with my pet project. I noticed that Goodnight, Fish hooked up with Tame... Tame and Quiet for a couple of shows together a while back. Was it one in DFWd and one in Austin? How'd that connection come about? I’m not really the one to ask about that… but as far as I understand, this friendship arose from the great Metrognome Collective. We were lucky enough to make their acquaintance and even luckier still to play with them. We played with them in Denton, and were supposed to play at the Mohawk in Austin, but a misunderstanding deprived Austin of Tame, Tame that night. Unfortunate - they’re amazing, as you all know. Whereas Tame...Tame & Quiet is not an intuitive match for the type of music you make, Theater Fire and Mermaid Blonde seem like you'd complement eachother very well. How did Saturday's show with Theater Fire get arranged? Do you know the guys in Theater Fire? It’s kind of a weird complement don’t you think? I’m not exactly sure how this happened – internet friendship allowed this opportunity, but I’m not sure how they thought of us. We’ve only played a handful of shows in Austin, and the record is still forthcoming, and we’re terribly excited to get to play with such a great band. 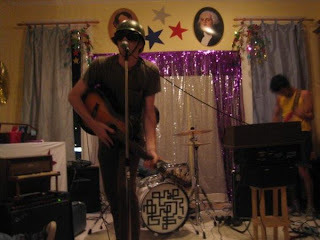 I’d found a Theatre Fire cd years ago (bought it used, turned out it was a free demo) and then ended up playing in Denton with them when I was filling in on drums with The Lovely Sparrows. So I sort of know them, and was awed by the show they put on. The number of places to see music around here has been dwindling at a steady pace for some time now. It's a great bar, but Lee Harvey's isn't really in the rotation as far as smallish rock venues go. Every once in a while they seem to step up to the plate with a nice show. A lot of people think that it reminds them of an "Austin" bar. Hopefully playing there will represent an improvement over the various Austin living rooms you've experienced. Have you ever been there? I’ve never been to Lee Harvey’s. Can you give me directions? It’s huge improvement over trying to play through my sad PA at a friend’s house while people spill beer on our equipment. Dallas seems like a hard town to ‘crack’ musically, and I’m pretty ignorant about the venues there. I hope it’s not too much like an Austin bar – all that would mean is expensive drinks and no smoking. What's the last show you played as Mermaid Blonde? Do you expect to play Saturday night pretty wheels off, or do you have things more or less polished? The last show we played was almost impromptu. We were going to play another living room, then not, then we did. This was on 7-7-07 and it was a prime example of Mermaid Blonde unpolished, or at least unpracticed. Thanks for reminding me. The lineup for the Dallas show will make it more polished and more stripped down yet more glorious at the same time. This show is only a three piece, and this is two of the members’ first show with me, and they sound awesome. We’ve added guitarist Steven Garcia (who is Ghost Night, is also an alumnus of The Lovely Sparrows and is closely affiliated with the Austin label Natrix Natrix) and of course Brendan. Basically, we’ve thrown this together quickly but not haphazardly and these two fellows are helping me realize my dream of a Grand but lo-fi interpretation of an ill-fated seafaring voyage. In short, this incarnation of the band will be polished to just the right extent, and should be able to more closely express what exactly Mermaid Blonde is. Only if you request a song we plan on playing. On thing is for sure though, we’ll be playing a special song that everyone should know. Goodnight, Fish is scheduled to play at Hemphill on Dec. 7th. Here's a link to a session they played on 91.7FM out of San Antonio. Everybody, try coming out To Hal Samples b-day party at Space tonight! 2814 Main Street, starts at 8, Art, Silk Screening, photobooths, and bands. 5 Dollars gets you the perks. It'll be a blast! Nice interview. I've been looking for a reason to head out to Lee Harveys. Theater Fire and Mermaid Blonde it is. I like your music- both Goodnight, Fish and this one. Austin seems like the Indie scene and I may just have to move there so I can become as awesome as all of you people.